During International Education Week, flags representing the home nations and territories of Nebraska Business students adorn the Henrickson Family Atrium. The celebration, coordinated by the Office of Global Strategies, kicks off Monday with a flag hunt. The International Student and Scholar Office hosts the event, where students have a chance to win a $50 gift card to the University Bookstore if they find the five international flags and international student education spotlight sheets hidden around City Campus. The College of Business offers a variety of special events including From Suitcase to Briefcase: Selling Your Study Abroad Experience to Employers, "The Future of Globalization" Panel, Global Opportunities Fair and Mini Language Lessons. 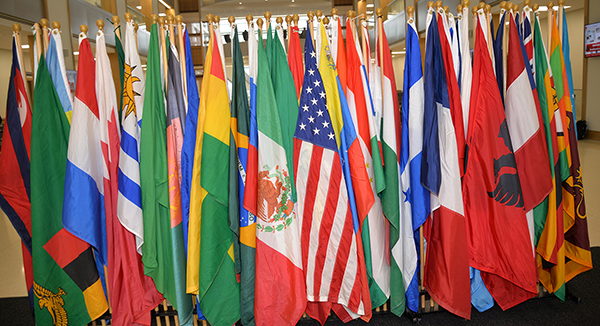 Flags of nations and territories representing Nebraska Business student home countries can be found in the Henrickson Family Atrium. Students may take photos of themselves with their home flag and tweet them with the hashtag #iew2018. Students and staff may take photos with the flags in Howard L. Hawks Hall. At the end of the week, the International Business Club and Center for Entrepreneurship will host the inaugural Nebraska Hult Prize Challenge. Students, in teams of three or four, will pitch their idea to create 10,000 meaningful jobs in the next decade. The winning team will represent the university at one of 25 regional events in the spring, with a chance to ultimately win $1 million to enact their plan and present it to the United Nations. Monday, November 12, 3:30-5 p.m. So you’ve been abroad – but now what? In this come and go session, talk with career professionals on how to talk about your experience abroad. Bring a copy of your resume, your LinkedIn login and even your interview skills and see how you can set yourself apart from the crowd with your international experience. Hosted by the College of Business International Business department and Business Career Center and College of Education and Human Sciences. Tuesday, November 13, 12-1:30 p.m. Hosted by the Global Studies Program and International Business, this panel will bring together experts from different disciplines across campus to talk about the effect of globalization on economy, politics, and national security, and the way in which it is affecting the lives of people across the globe as well as in our own communities in Nebraska. Brown bag lunch with appetizers provided. This event is free and open to the public. No registration required. Thursday, November 15, 11 a.m.-2 p.m. This event provides the opportunity for globally-minded students to explore options available in Nebraska and beyond, both now and post-graduation. The fair will feature businesses and non-profit organizations, as well as education abroad programs. This is a collaborative event, hosted by International Business, Global Studies, Education Abroad, and the Business Career Center. Friday, Nov. 16, 1-2 p.m. Even knowing a few words can go a long way. Stop by for the Mini Language Lessons, hosted by College of Business international students. Pick up a few key phrases in a variety of languages. To view the full list of activities visit: http://go.unl.edu/iew2018.